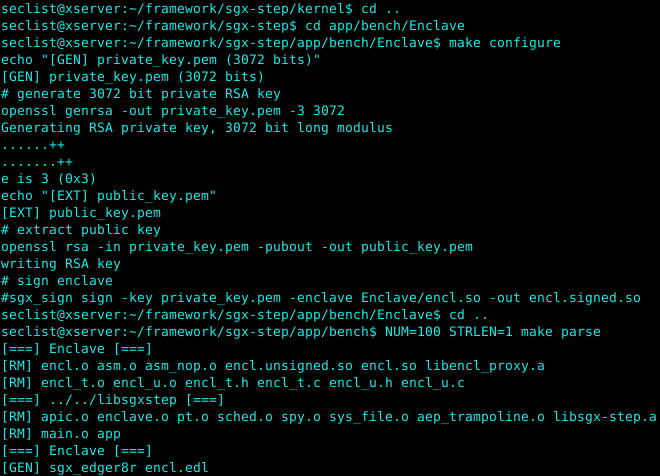 Browse: Home / SGX-Step ~ A practical attack framework for precise enclave execution control. Protected module architectures such as Intel SGX hold the promise of protecting sensitive computations from a potentially compromised operating system. Recent research convincingly demonstrated, however, that SGX’s strengthened adversary model also gives rise to to a new class of powerful, low-noise side-channel attacks leveraging first-rate control over hardware. These attacks commonly rely on frequent enclave preemptions to obtain fine-grained side-channel observations. A maximal temporal resolution is achieved when the victim state is measured after every instruction. Current state-of-the-art enclave execution control schemes, however, do not generally achieve such instruction-level granularity. This paper presents SGX-Step, an open-source Linux kernel framework that allows an untrusted host process to configure APIC timer interrupts and track page table entries directly from user space. We contribute and evaluate an improved approach to single-step enclaved execution at instruction-level granularity, and we show how SGX-Step enables several new or improved attacks. Finally, we discuss its implications for the design of effective defense mechanisms. Crucial to the design of SGX-Step, as opposed to previous enclave preemption proposals, is the creation of user-space virtual memory mappings for physical memory locations holding page table entries, as well as for the local x86 APIC memory-mapped I/O configuration registers. This allows an untrusted, attacker-controlled host process to easily (i) configure the APIC timer one-shot/periodic interrupt source, (ii) trigger inter-processor interrupts, and (iii) track or modify enclave page table entries directly from user-space. The above figure summarizes the sequence of hardware and software steps when interrupting and resuming an SGX enclave through our framework. – The local APIC timer interrupt arrives within an enclaved instruction. – The processor executes the AEX procedure that securely stores execution context in the enclave’s SSA frame, initializes CPU registers, and vectors to the kernel-level interrupt handler. – Our /dev/sgx-step loadable kernel module registered itself in the APIC event call back list to make sure it is called on every timer interrupt. At this point, any attack-specific, kernel-level spy code can easily be plugged in. 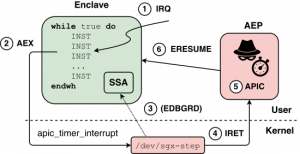 Furthermore, to enable precise evaluation of our approach on attacker-controlled debug enclaves, SGX-Step can optionally be instrumented to retrieve the stored instruction pointer from the interrupted enclave’s SSA frame using the EDBGRD instruction. – The kernel returns to the user space AEP trampoline. We modified the untrusted runtime of the official SGX SDK to allow easy registration of a custom AEP stub. – At this point, any attack-specific user mode spy code can again easily be run, before the single-stepping adversary configures the APIC timer for the next interrupt, just before executing (6) ERESUME. git clone https://github.com/jovanbulck/sgx-step && cd sgx-step git submodule init git submodule update ./patch_sdk.sh Build and load /dev/sgx-step cd kernel make clean load Build and run test applications For example, to build and run the strlen attack from the paper for a benchmark enclave that processes the string 100 repeated times, execute: cd app/bench/Enclave make configure cd .. NUM=100 STRLEN=1 make parse The above command builds libsgxstep, the benchmark victim enclave, and the untrusted attacker host process, where the attack scenario and instance size are configured via the corresponding environment variables. The same command also runs the resulting binary non-interactively (to ensure deterministic timer intervals), and finally calls an attack-specific post-processing Python script to parse the resulting enclave instruction pointer benchmark results. The Python scripts require the address of the benchmark instruction to be filled in (can be easily retrieved with objdump -D encl.so after compilation). 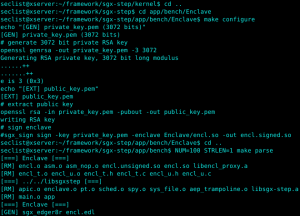 The above command builds libsgxstep, the benchmark victim enclave, and the untrusted attacker host process, where the attack scenario and instance size are configured via the corresponding environment variables. The same command also runs the resulting binary non-interactively (to ensure deterministic timer intervals), and finally calls an attack-specific post-processing Python script to parse the resulting enclave instruction pointer benchmark results. The Python scripts require the address of the benchmark instruction to be filled in (can be easily retrieved with objdump -D encl.so after compilation). ← JENNOM – Java Enterprise Network Nodes Monitoring.